Sir Philip Sidney, as a poet, is found opposed to all poetic conventions and affectations even when he adheres to the primary forms and generic qualities of contemporary English poetry. However, his sonnets are free from the artificiality of conventional poetic works and are distinctly sincere. 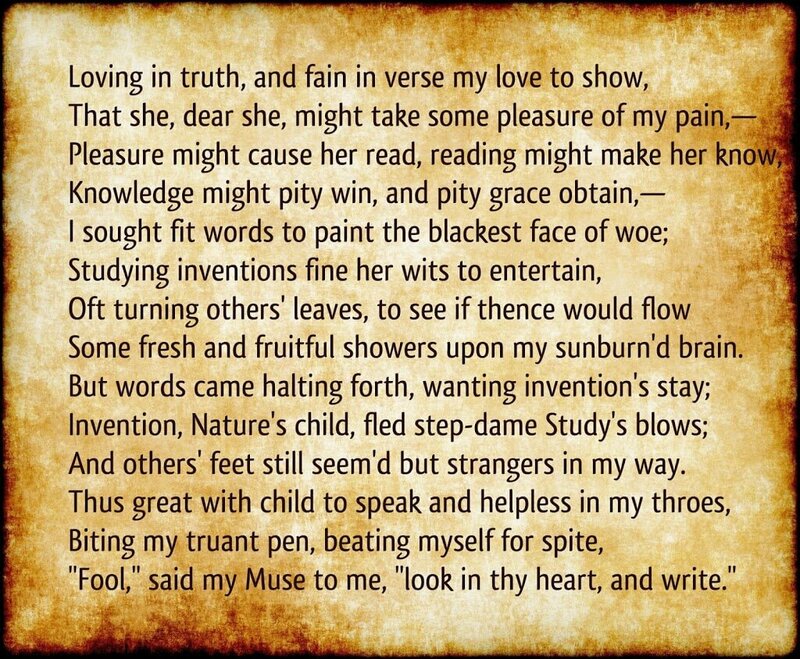 As seen in his sonnet “Loving in Truth”, certain traits of his personality emerge significantly. 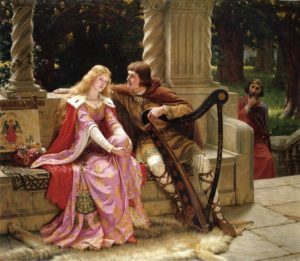 It is the first poem in his sequence, “Astrophel and Stella” and seems to contain the bearings of his lover’s pulse, in suspense and expectation. Indeed, the poem rings with a lover’s intimate feelings and sufferings. Love is seen as an ideal that requires selfless dedication and earnest yearning. Sidney’s tone is animated with an idealistic zeal, which is free from egoism. 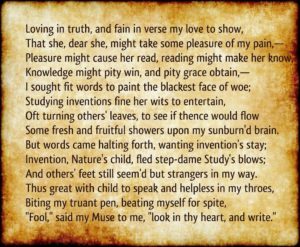 The singleness of emotion, pertaining to love, that characterized the Petrarchan sonnet is also found in this poem. There is, no doubt, a transition in the poet’s mood from the octave to the sestet, but the essential unity is always present and the emotional content remains unaltered. The sonnet is rich in imagery that is pleasant but precise. The analogies of “other’s leaves” and “fresh and fruitful showers” are well conceived, and the metaphor of “sun-burned brain” is very original. Equally interesting are his personifications of “Invention”, “Nature” and “Study”. There is usually no vagueness about his images. Even farfetched expressions like “Step- dame study’s blows” and “truant pen” are quite witty and relevant to his contention. The poem is not a helpless lament of a lover. It has no angry declination or renunciation, but rather filled with amorous optimism. There is hardly any monotonous glorification of unrequited love. However, structurally, the poem is Petrarchan in its division of theme into eight and six lines. There are some variations in the metrical arrangement and the lines are found to rhyme alternately, except the concluding couplet. 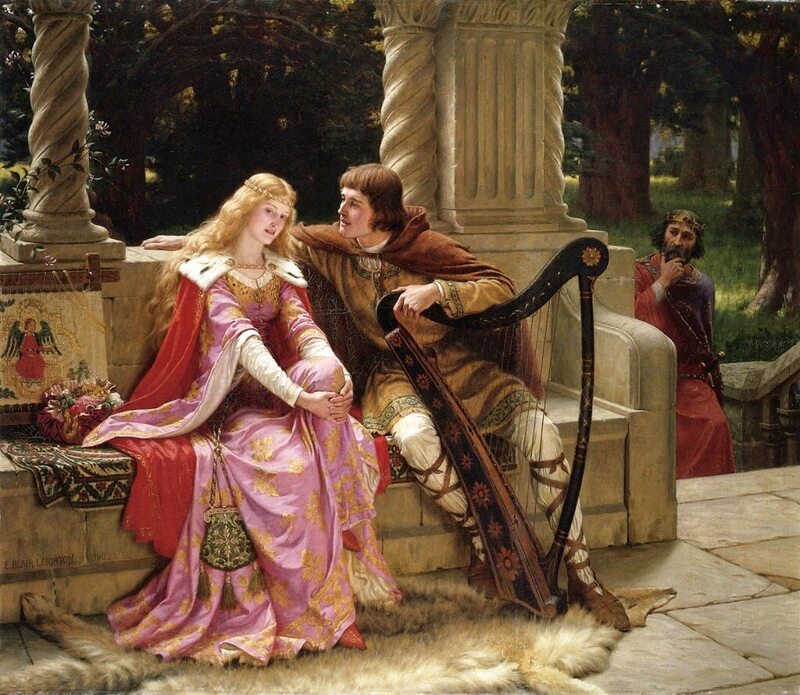 The octave (the first eight lines) consists of the poet’s frantic efforts to please his beloved by his poetry. The sestet (remaining six lines) shows his failure and final realization. His diction is well chosen while his imagery is plain yet impressive. The poem, therefore, both conforms to and deviates from the contemporary style of sonnet writing. It is characterized by a blend of wit and sensibility, of intellectual brilliance and temperamental ardor. Sidney’s sonnets, in their directness and spontaneity, remain an intimate record of the mind of a man who was both sincere and chivalrous. In his depth of sincerity and range of subjectivity, Sidney remains no less great than Shakespeare himself. His poems represent one of the most genial and original literary expressions of a true poet’s profound emotion of love.